If you were in the spy game, the first thing you would confiscate from any opposite number would be his watch. This gadget filled time-piece includes a detonating pin that works to explode C4. Press another button and it starts, twist the bevel and bang you go. Press the wrong button and you could cut your fingers off with the powerful laser. 007 must have memorised the instruction manual on the plane over. There’s just so much to remember. Actually, we earn later - Bond doesn't do instruction manuals. We learn a little later that the laser has been re-installed in the time-piece. It's the 20th James Bond film, you see. 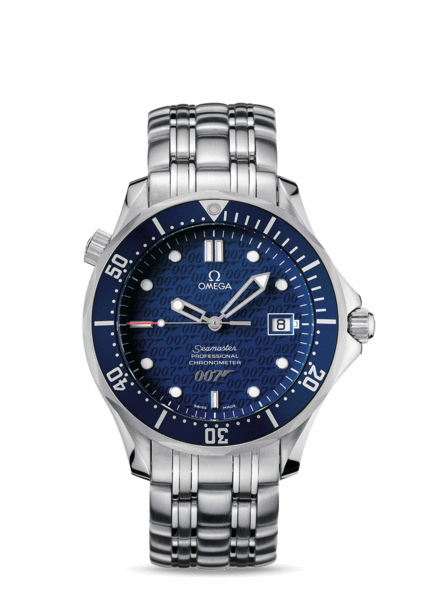 James Bond had moved away from Rolex (Ian Fleming's brand of choice for his character), in Goldeneye, in favour of the Omega Seamaster Professional Diver, which would be worn by Pierce Brosnan in all of his James Bond movies. The first model in Die Another Day is the Professional 2531.80 Quartz, stainless steel full sized with blue face, blue bezel with a stainless steel bracelet. The second watch is unknown, but as they were celebrating the 40th anniversary of Dr No, we will presume it is exactly the same watch and the limited edition version (2537.80) below was just for the potential purchasers.